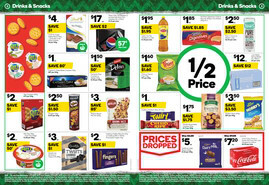 Check out Woolworths’ best deals and special offers in their online catalogue and weekly ads. One of the most recognised stores in Australia, Woolworths understands that Australians want the freshest groceries at the most affordable prices. As part of their Fresh or Free Guarantree, any item that you’re not satisfied with will be refunded. While operating times vary, stores are open 7 days a week for your convenience. Shop online with Woolworths and they’ll deliver to your front door. Morning, afternoon or evening deliveries are available 7 days a week before 10pm. There are also convenient order times for next day deliveries! Spend $30 or more on your first shop and delivery is free. Choose to spend $150 or more online and Woolworths will deliver for free on Wednesdays! Joining this rewarding loyalty program helps you save real money. By becoming a member, you can earn Woolworths Dollars every time you purchase orange ticket groceries. When your balance reaches $10, scan your card or shop online and you’ll get $10 off your next eligible purchase! 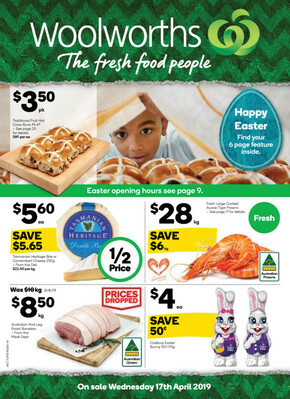 Get up-to-date information about Woolworths' hours, coupons, flyers, and deals at the Shopfully website or app.